Visitors to the Hollywood Roosevelt can mingle with guests, locals, and Hollywood A-listers at the hotel's nightclub, enjoy food and drinks by the pool, dine on award-winning burgers, or play at the gaming lounge and bar. 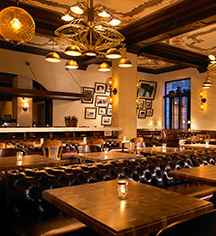 Created by Executive Chef and Restaurateur Tim Goodell, Public Kitchen & Bar is a critically-acclaimed American brasserie. A wide selection of charcuterie, artisan cheeses, and house-made preserves fill the delightful menu. The relaxed restaurant is furnished with industrial-chic brass chandeliers, tufted leather banquettes, and a historic mural that was rediscovered during the renovation process. Dinner: Monday to Saturday, 5:30 p.m. – 10:30 p.m.
Late night menu: Friday & Saturday, 10:30 p.m. – 11:30 p.m. Happy hour: Monday to Friday, 3:00 p.m. – 7:00 p.m.
A 1960s style café and bar made for poolside indulgence. This dynamic venue, beside the famed David Hockney pool, offers a laid-back atmosphere, perfect for relaxing, sipping on cocktails, and enjoying food without ever leaving the poolside day beds. In the evenings, it turns into a lively bar with twinkling lights in the trees, music for dancing, and plenty of drinks. Lunch: Sunday to Thursday, 10:30 a.m. – 12:00 a.m.
Poolside dining: 10:30 a.m. – 10:00 p.m. The Spare Room, known for many years for exactly what it was - a spare room, is now the hotel's best-kept secret. 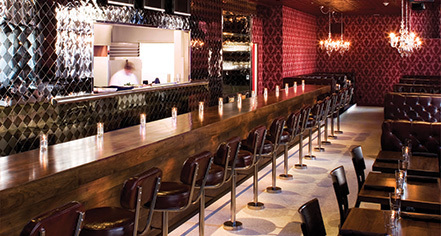 Tucked behind a set of double doors, the Spare Room features a two-lane, vintage bowling alley that runs adjacent to the game parlor and cocktail lounge. Guests are invited to bowl, while overlooking Hollywood Boulevard through the Spare Room’s signature, cast-iron-arched-windows. The Prohibition-era inspired gaming parlor and cocktail lounge, replete with custom-made wooden board games, including chess and Jenga, and noteworthy cocktails, create an epic night out in L.A.
Wednesday to Monday: 8:00 p.m. – 2:00 a.m. The Library Bar provides an intimate space with comfortable couches and soft lighting that often attracts Hollywood A-listers. There are no menus here, just choose the ingredients and flavors and the staff will fashion the libation. Named after the precise temperature difference between a raw and well-done hamburger, 25 Degrees introduces a glam twist on the traditional American burger joint. The award-winning, 24-hour, burger joint serves signature shakes, fries, and sandwiches in an upscale diner atmosphere. Available 24 hours daily, choose from a select menu that includes all-day brunch items from the Tropicana Café and diner-style fare from 25 Degrees.